List of Government Private Colleges in Tamil Nadu: The Selection Committee Directorate of Medical Education, Government of Tamil Nadu will fill 85% of state quota medical/dental seats through NEET UG 2018. There will be no state medical entrance exam for Tamil Nadu medical admission 2018. All candidates will be selected on the basis of their state quota NEET 2018 Merit list. So, all 85% seats of MBBS and BDS in Medical and dental colleges will be filled through state quota merit list and the remaining 15% seats that are All India Quota will be filled through NEET 2018. Tamil Nadu Medical Committee will accept registration form for 2172 MBBS seats in 19 Government medical colleges and 85 BDS seats in 1 dental college. Interested candidates can fill the application form from June month 2018. The complete state quota counselling schedule will be published after NEET Result 2018. The Selection Committee Directorate of Medical Education, Government of Tamil Nadu will release the candidate’s NEET 2018 state quota rank and the merit list. All listed candidates will be called for the counselling process as per the schedule. The Counselling will be conducted in offline mode in two rounds. Tamil Nadu MBBS and BDS admission 2018 counselling will be conducted at the Govt. Multispecialty Hospital, Omandurar Estate, Chennai. Candidates will get SMS notification regarding counselling procedure. 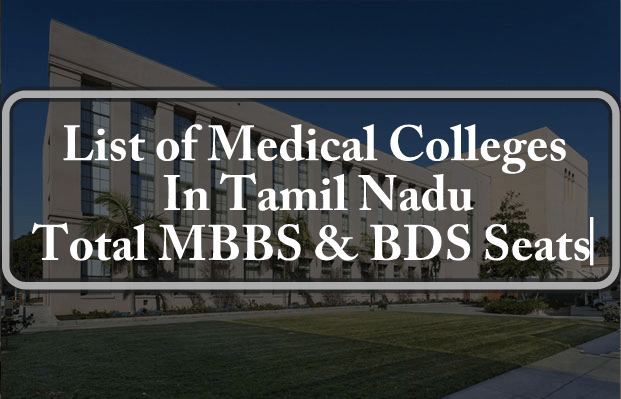 In this article, we have listed all Medical Colleges and total seats in Tamil Nadu state. It will help you all to take admission in a good medical college. 6 D.D. Medical College and Hospital, Tiruvallur, Chennai The Tamilnadu Dr. MGR Medical University, Chennai 2010 0 Recommended for withdrawal of LOP granted for Establishment. 7 Dhanalakshmi Srinivasan Medical College and Hospital, Perambalur The Tamilnadu Dr. MGR Medical University, Chennai 2011 150 Permitted for renewal of permission u/s 10(A) for 2013-14. 8 Karpaga Vinayaga Institute of Medical Sciences, Maduranthagam The Tamilnadu Dr. MGR Medical University, Chennai 2009 100 Permitted for renewal of permission for the year 2013-2014. 9 Karpagam Faculty of Medical Sciences & Research, Coimbatore The Tamilnadu Dr. MGR Medical University, Chennai 2012 150 Permitted for renewal of permission u/s 10(A) for 2013-14. 11 Meenakshi Medical College and Research Institute, Enathur Meenakshi University 2003 150 Recognized for 100 when granted on or after March, 2009. Permitted for renewal of permission for increase of seats from 100 to 150 for 2013-14. 12 Melmaruvathur Adiparasakthi Instt. Medical Sciences and Research The Tamilnadu Dr. MGR Medical University, Chennai 2008 150 Permitted for renewal of permission u/s 10(A) for 2012-13. 13 PSG Institute of Medical Sciences, Coimbatore The Tamilnadu Dr. MGR Medical University, Chennai 1985 150 Recognized for 100 seats.Permitted for renewal of permission for increase of seats from 100 to 150 for 2013-14. 15 Saveetha Medical College and Hospital, Kanchipuram Saveetha University, Chennai 2008 150 Recognized on or after January, 2013. 17 Sree Balaji Medical College and Hospital, Chennai Bharath University, Chennai 1999 150 Recognized for 100 seats. Permitted for increase of seats from 100 to 150 for 2013-14. 19 Sri Muthukumaran Medical College, Chennai The Tamilnadu Dr. MGR Medical University, Chennai 2010 150 Permitted for renewal of permission for the year 2013-14. 22 Tagore Medical College and Hospital, Chennai The Tamilnadu Dr. MGR Medical University, Chennai 2010 150 Permitted for renewal of permission for the year 2013-14 vide Honourable Supreme Court order dt.13.07.13 in SLP No.25812. 23 Velammal Medical College Hospital and Research Institute, Madurai The Tamilnadu Dr. MGR Medical University, Chennai 2013 150 Permitted u/s 10(A) for 2013-14. Final Word: Stay in touch for more upcoming updates related to Tamil Nadu NEET UG Counselling 2018 till then keep reading our other articles. Hi Tarun, This is Karthik. Are u looking for MBBS/BDS Admission in Tamilnadu and Pondicherry. Am doing admissions for those stuedents in management quota and if u have any query, am ready to guide and can get u MBBS admission for those in reputed college. For further call me @ 9840737564 and whats app the 2 mark sheet and Neet score card. Thank You and All the Best. there are few seats in Saveetha Dental college. You should have cleared NEET with 50 percentile..no capitation,last date for admission 30/9/2016..reply me if interested..
You are medical college student. Hi, This is Karthik. Are u looking for MBBS/BDS Admission in Tamilnadu and Pondicherry. Am doing admissions for those stuedents thru management quota and if u have any query, am ready to guide and can get u MBBS admission for those in reputed college. For further call me @ 9840737564 and whats app the 2 mark sheet and Neet score card. Thank You and All the Best. Great list, very useful and informative. What would be the minimum NEET score to get a free medical seat in government colleges for BC? 85percentage quota for NEET students? The notification will be released after the NEET result. We will soon publish about TN management quota medical and dental seats. Hi dear all, I would like to know about management quota seats in TN. So kindly let me know as soon as possible. Kind regards, Natarajan. What is the qualifying mark for neet 2017? I want to know the details of MBBS course in tamilnadu and there fee structure and any other extra payment.I qualified in NEET. I want admission for MBBS in TN or Karnataka private medical college. sir i am from andhra pradesh. i got 399 marks in neet am i eligible for karnataka bds colleges will i get there?